Finding the right saw blade for your table saw can make the difference in whether or not your cut is accurate and precise. When looking for the best table saw blades, it can seem overwhelming to a degree. There is an abundance of manufacturers of table saw blades, and they each seem to have their own code of benefits and advantages they offer. To help you narrow down your decision of which is the best saw blade, we reviewed the following and named our top pick. Find out which one we selected. ​As you peruse the shelves for table saw blade types, you need to keep the following things in mind. These factors can make a big difference in the quality of blade you select and can ensure you get that smooth cut you have been seeking. ​Start with the blade size you need for your table saw. We recommend the 10-inch blade diameter because it is a multi-purpose blade that can often be used in other saw tools. With a 10-inch blade, you have plenty of flexibility in the size of material you cut. This can maximize your capabilities and allow you to cut materials to all different lengths. But, if you have a particular application you spend a lot of time cutting with, you may need a different size blade for better performance. ​To really find the ​highest rated table saw blades, you need to keep your eye out for carbide-tipped teeth. This provides the maximum durability when cutting with the blade and will ensure you get that smooth, fine cut every time. Carbide-blades are strong and have the aggressiveness to cut through a myriad of materials. These are the best types of table saw blades you can buy. Even though they cost more, they are well worth the investment. ​You also need to think about how fine a cut you need. This will determine the teeth number on the blade. The more teeth configured along the edges of the blade, the more it will impact your cut. Low teeth numbers do not provide a fine cut and are primarily good for ripping wood ​without any accuracy like a demolition saw. If you are looking for a smooth finish when you cut, choose blades that have 50 or 60 teeth. ​The kerf of your table saw blade is also an important feature. The thinner the kerf on your blade, the finer the cut it will make in your wood piece. This can be extremely helpful as it can reduce your need to sand a piece after cutting and reduce your total wood waste. Try to find a good table saw blade that incorporates the thinnest kerf as possible. ​Table saws vibrate, and this can affect cut accuracy. Some manufacturers try to alleviate the vibration of the blade by putting a coating on the blade the reduces resistance. Others use strong carbon steel in the construction of the blade to prevent it from bending. Try to find features such as these that decrease vibration as well as noise emittance, or ​by simply using a table saw​ fence. ​​A top rated table saw can change the way you do woodworking. Read our reviews here. ​The type of material you are going to cut also makes a difference on your blade choice. You need a blade that is rated to cut both hard and soft woods as necessary. Some blades will allow you to cut other materials as well with the same model. Think about what materials you primarily cut. Make sure your blade is rated to go through these wood thicknesses without issue, so you don’t damage the blade, or your table saw. ​We particularly like blade manufacturers that offer warranties on their blades. The quality manufacturers offer blades with lifetime warranties. But, they do cost more. Others don’t require that much of an investment but don’t offer the same extended coverage in a lower quality blade. ​We also like blades that can be re-sharpened by the manufacturer. This is a nice feature to have. Quality blades typically offer this service and allow you to use the blade on your table saw for many years. Find out if the table saw blade manufacturer that you are looking to buy your blade from offers re-sharpening of the blade at a cost or free. In either case, it would be cheaper than buying a new high-quality blade. ​Also, keep in mind the total life expectancy of the blade you intend to buy. We have found the best table saw blades last for many years. If you constantly have to replace your blade, it may be time to look at another manufacturer’s offering. Quality table saw blades should last 10 years or more, giving you many years of use without wear. ​The budget you have for your table saw blades may help decide which brand you choose to buy. Blades that are more expensive are more durable and provide a better cut. Blades that are cheaper in price often don’t produce the best results. Look to spend as much as you can on a blade. This is one time when price does dictate quality and can make a difference whether you have the best table saw blades. ​You’ve probably seen many table saw blade reviews at this point. We have, too. But, we took additional care in finding the best table saw blade for you with the following products. We looked at all the key features we thought were important in determining which saw blade to buy for your table saw. We’ve boiled all the details down into a concise and informative read that will make it easier than ever for you to pick the right blade to use in your table saw application. ​To kick off our reviews of the best 10 inch table saw blade, we started with the very durable ​TOMAX 10-Inch 60 Tooth Saw Blade. This table saw blade is ideal for cutting all kinds of wood which is primarily what you use your table saw for. Hardwoods and softwoods cut with ease using this blade and it is mostly due to the carbide teeth fitted around the edges of the blade. This allows for a longer life out of the blade by providing the maximum amount of reduced resistance possible. For even more durability and life, the blade has an electrophoretic coating to resist rusting and corrosion. You can easily use this blade with your miter saw too, giving you plenty of application and flexibility when cutting. The blade is 10-inches, which you’ll find to be the most useful blade size. It has 60 teeth per inch. It is rated up to 6000 rpm and has an arbor of 5/8 inches. 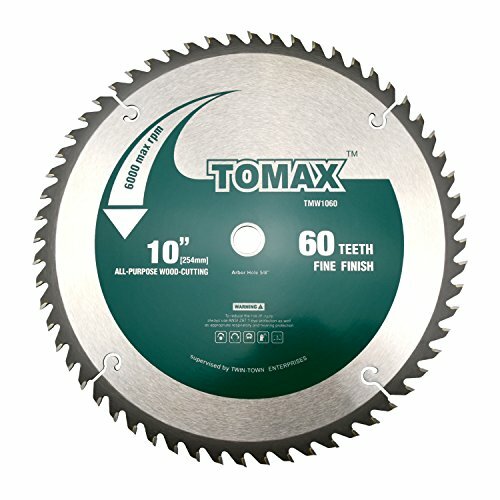 TOMAX also offers the fine finish saw blade with a limited lifetime warranty. The TOMAX fine finish saw blade is a decent blade for the money, but we found that it does have a lot of wobble as it cuts. This could affect the precision of the cut with your table saw. The blades do have carbide teeth to reduce resistance, which may help with the issue. ​On the import side, we have the ​Freud D1060X Diablo 60 Tooth Fine Finish Saw Blade. This blade is also 10 inches and provides a 60 tooth ATB for a finer cutting finish. The blade is easy-to-use and is manufactured in Italy. The teeth of the blade are TiCo high-density carbide with titanium. This gives the ​table saw blade its extremely long life and helps on the finish side to produce a quality cut result. The tips of the blades are also tri-metal brazed for impact resistance. The kerf of the blade has been laser cut to a thin width to give that fast, durable, and clean cut you are looking to achieve. A non-stick Perma-Shield coating has been applied to the blade to reduce heat build up as you cut. It also helps to reduce pitch build up as you saw. 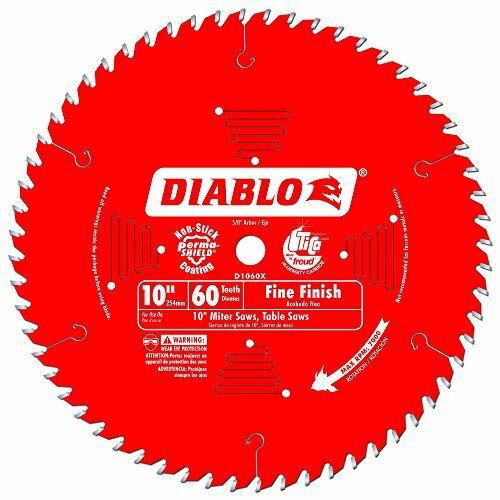 The Freud D1060X Diablo fine finish saw blade really has the works when you are looking for features in a saw blade. It has laser-cut stabilizer vents that help to keep noise and vibration to a minimum. This feature is key as it prevents the blade from warping and keeps it cool as you cut. This blade is really designed to make those fine crosscuts in both hard and softwoods. It can cut plywood without chipping as well as melamine and molding. In many cases, the blade prevents the need to sand after cutting because it leaves such a fine cut. The arbor of the blade is 5/8 inches, and it comes with a limited lifetime warranty. We are very impressed with the design of the Freud D1060X Diablo fine finish saw blade and its cutting ability. But, we did notice a downside to the engineering. It has a great deal of vibration as it cuts, which can cause some drag. However, the blade is coated with a non-stick Perma-Shield to help with this effect and it may not be too noticeable to some users. ​If you are looking for a good blade that stands up to the demands of professional use, you may want to consider the ​Concord Blades WCB1000T080HP 80 Teeth General Purpose Hard & Soft Wood Saw Blade. This blade has 80 teeth TCT and a 10-inch diameter. It packs a punch with 2.6 mm kerf, ATB grind, and 15-degree hook to it. Because the kerf is designed to be thin, it helps to provide that smooth finish without creating a lot of waste. The lower hook angle also enhances the cut quality while working to increase the required feed pressure. It also has a 5/8-inch arbor. 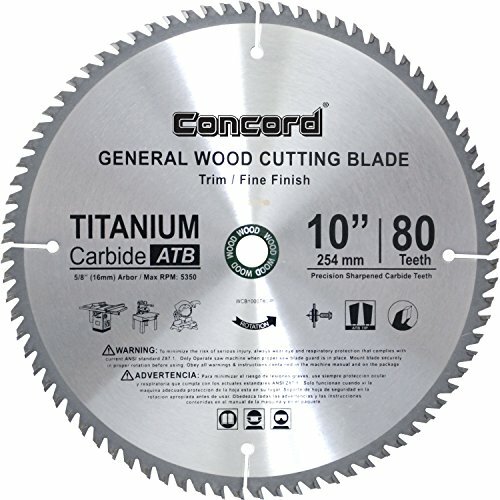 The Concord Blades WCB1000T080HP general purpose hard and softwood saw blade is really designed for professional construction use for applications like ripping and crosscutting. It can cut through hardwoods up to 3-1/2 inches thick and softwood with a 1-inch thickness. It stands up well when cutting exotic woods, decking, wood composites, and abrasive woods as well. This blade has plenty of use as it can be used on your table saw as well as your miter saw, circular saw, handsaw, and chop saw. It offers a 5500 rpm, giving you plenty of speed as it cuts. We did find a few flaws in the design of the Concord Blades WCB1000T080HP general purpose hard, and softwood saw blade. As much as we wanted it to perform, we found the blade lacks the quality we typically like to see in a saw blade. Some consumers reported the teeth fell off or damaged when using the blade. The blade is specified for professional use and comes with a nominal price tag, but there may be some limitations to its design. ​We also took a look at the ​Forrest WW10407125 Woodworker II Kerf Saw Blade. Unlike the others that we reviewed thus far, this blade comes with a 0.125 kerf for better cut quality. The thin kerf produces fine precision cutting, leaving minimal waste as it moves through the wood. According to the manufacturer, it saves as much as 1/8 inch on wood loss for each cut. The blade also has a 40 tooth ATB and is 10 inches in diameter. It has a 15-degree ATB and a 20-degree face hook. The arbor is 5/8 inches, which helps to give you that smooth edge that doesn’t need additional sanding to finish. These table saw blades are almost completely handmade and use C-4 carbide teeth that have been hand-brazed to the plate of the blade. The Forrest WW10407125 Woodworker II saw blade has a quiet design and allows for backside tear out in plywood. It is the ideal saw blade for hard or softwoods. Forrest offers a warranty and will re-sharpen the blade if requested. As much as we were impressed with the Forrest WW10407125 Woodworker II saw blade, we did find a downfall we wanted to mention. The blade does have a high price tag that may turn some buyers off. We do want to point out that the blade can be re-sharpened, allowing you to have it for many years. It is a quality blade that performed well and provides a good quality cut without burn or backlash. 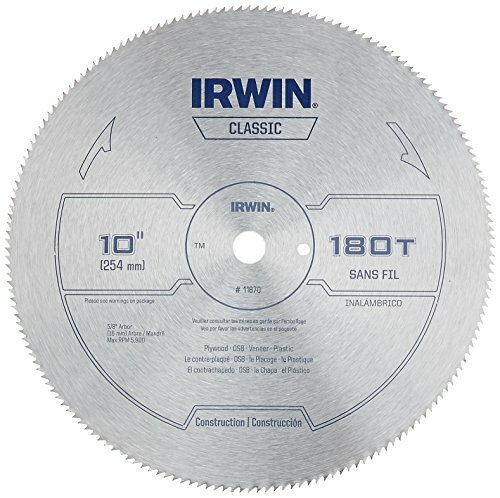 ​Lastly, we have the ​IRWIN Tools Classic Series Steel Table / Miter Circular Saw Blade. This blade is precision grounded with 180 teeth that top and face grind. Blade length is 10 inches in diameter, and the arbor is 5/8 inches. The kerf of the blade is 0.09 inches to provide that thin quality cut. The blade has been fully hardened to allow for a truer operation. It has good durability and will run and last through many cuts. The blade itself has been constructed of heavy gauge, high-carbon steel. This is also designed to give the blade a longer life. The teeth of the IRWIN Tools Classic Series steel table/miter circular saw blade are precision ground to give you that smooth, accurate cut. You’ll find this blade can cut through plywood, veneer, and plastic with ease. It can be used on your table saw as well as your miter saw for more versatility. It also has a low price tag that makes it affordable to replace as necessary. While we did find the IRWIN Tools Classic Series steel table/miter circular saw blade was a very capable table saw blade, we did find a drawback that is important to note. We found this blade doesn’t offer carbide tipped teeth, which we feel is necessary for longevity as well as durability and cut quality. But, IRWIN does use high-carbon steel in the construction of the teeth, which is a nice addition to the blade. ​Our choice for the best table saw blade was an easy one. 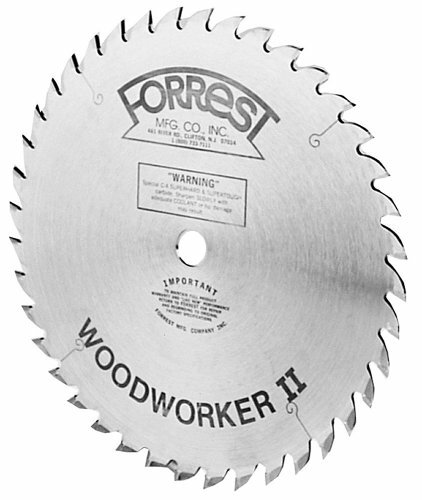 We chose the ​Forrest WW10407125 Woodworker II Kerf Saw Blade. Even with the high price tag on the blade, we found it to be the best value for the money. With the ability to re-sharpen it as it dulls and its integration of carbide teeth, it is a solid investment to make for your table saw. It gives you that smooth, quality cut without the need to do additional sanding. Plus, it has little wood waste, which will save money with its use. ​Using the Forest blades with your​ table saw is not only a wise investment, but it is one that will pay for itself with years of use.